An air of urgency has been visible at the Mumbai headquarters of the second-largest Indian pharmaceutical company by sales, Lupin Ltd, for the past three to four years. In September 2013, Dr Desh Bandhu Gupta, a former BITS Pilani professor and founder of the 48-year-old Lupin, had set a stiff target for the company while appointing his son Nilesh Gupta as Managing Director and daughter Vinita Gupta as Chief Executive Officer. The goal was to make Lupin grow more than threefold to become a $5 billion company (Rs 32, 000 crore) by 2018. To assist Nilesh and Vinita, the long-serving MD Kamal K. Sharma was made a mentor of the two and elevated to Vice Chairman of Lupin. "While we agree that it is an ambitious target, that is the way we have grown in the past. We believe we will surpass that target in the next four years," says Nilesh. His elder sister Vinita also appears confident. "In the past few years, we were investing for the stellar growth we are currently witnessing and, similarly, the results of our current efforts will be seen in the future." Lupin's revenues rose from `9,462 crore in the financial year 2013 to `13,758 crore in FY2016, surging 45 per cent. In the nine months ended December 31, 2016, they rose by a robust 34 per cent to `12,958 crore over the same period last year. Net profit was up 72 per cent to `2,261 crore between FY2013 and FY2016; for the nine months ended December 31, 2016, it shot up 44 per cent to `2,177 crore over the previous year. Not many Indian companies can boast of such exponential growth. Vinita joined the company in 1993, followed by Nilesh three years later. After a decade of working in various divisions of Lupin, Vinita went to the US in 2005 to scale up business there. Nilesh decided to focus on the domestic market and backend operations. At that time, the US and European business were contributing barely below 5 per cent of Lupins revenues of $270 million. 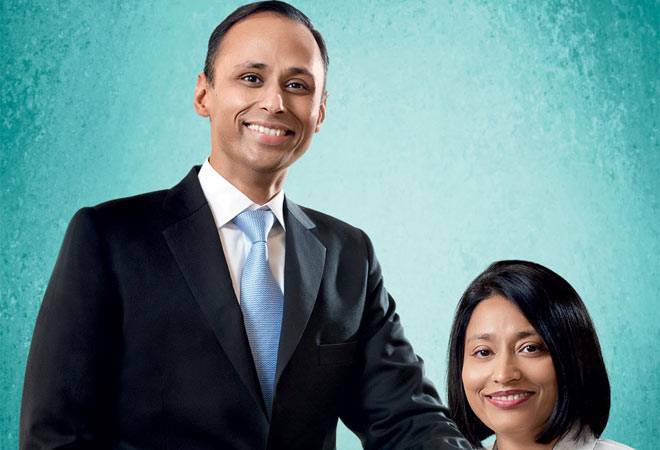 Since then, the main engine for Lupins phenomenal growth has been the US market and a string of acquisitions - 10 companies and 4 assets from 2007 till date engineered by Nilesh and Vinita. The US contributes 45 per cent of Lupin's global revenues. Comparatively, exports to regulated markets was just 16 per cent of Lupin's total sales of `1,312 crore in FY2005. Nilesh is a chemical engineer from the University Department of Chemical Technology, Mumbai, and an MBA from the Wharton School. A workaholic, he unwinds by playing with his three-and-a-half year old daughter Veda when he gets the time. The US-based Vinita is a graduate in pharmacy from the University of Mumbai and an MBA from J L Kellogg Graduate School of Management. Vinita, fond of networking with peer professionals, travels extensively across the world from her base in Maryland. Her husband Brij Sharma, who runs his own business in the US, takes care of their 11-year-old son Krish when she is away on work. "Both Vinita and Nilesh are clear in their thoughts, take speedy decisions and are aggressive. They are also evaluated like any other professional working in Lupin," says Kamal Sharma, their mentor and Vice Chairman. Other observers, too, laud the leadership skills of the brother-sister duo. "I noticed something that is fairly uncommon in Vinita, which is her ability to balance a successful and intense professional life with her personal and family life. Family is always at the centre of her conversations," says Francesco Granata, Senior Advisor at Warburg Pincus, a leading global private equity firm. Nilesh and Vinita are now running the company with Kamal Sharma and D.B. Gupta helping them only in making strategic decisions and with broad directions. Vinita and Nilesh say they interact with each other every day. "We don't differ much on ideas and mostly agree nine out of ten times. If he does disagree, I think over it again and again to find a solution," says Vinita. Indeed, Vinita and Nilesh have been able to grow revenues and profits through a major transformation - creating the US business. Lupin is now the fifth largest generic company in the US (by prescriptions). It is focused on complex generics, such as inhalation products and depot injectables, and aims to build a significant specialty business in the US, while working to achieve the target of $5 billion set by the 'mentors'. The company is now investing nearly 13 per cent of revenues into research and development. Vinita and Nilesh say that the US, Japan, Latin America and European markets - besides India - are going to be the key drivers for Lupin's growth in future. They estimate that organic growth can contribute about $4 billion and another $1 billion can come from inorganic growth to reach the target of $5 billion. While analyst Prakash Agarwal of Axis Capital estimates Lupin to reach `22,700 crore in revenues by 2018/19, Paresh Dave of Ambit believes Lupin can clock `27,872 crore by then. Manoj Garg of Merril Lynch maintains a more conservative revenue estimate than Dave - `23,860 crore by 2018/19. Whether or not the siblings are able to achieve their father's ambitious target, Lupin appears to be in safe hands for the moment.